One of the greatest perks of reviewing music (if you manage to overcome or, better, avoid becoming a bitter jaded cynic that no longer gets excited by anything in the process) is discovering talented musicians waiting to break out and seeing the formation of new bands as they happen. Ferum (no, this band isn’t called Perun, even though Cianide obviously was a key influence and they even cover the song ‘Funeral’ from them) is an Italian death/doom trio that is barely a year old but already scored a recording contract with Everlasting Spew Records and Unholy Domain Records for their debut EP “Vergence”. Ferum is made up of three seasoned underground veterans (two of whom have been in a band together earlier) and it’s evident that the darkness in the Italian catacombs is very much alive. It’s a rare and distinct pleasure discovering a band this young that has conceptualized its vision and overall direction of choice so precisely. Ferum is one such band and it makes a scribe as yours truly content to be a music critic. Samantha Alessi is a girl in the Italian underground metal scene whose progress as a songwriter and musician we’ve been monitoring with great interest over the last couple of years. Suffice to say the redhaired miracle has been in a number of different constellations during that time, but the newly forged Bologna-based Ferum (Latin for “fierce”) is the first unit where she is in complete creative control. “Vergence” (or ‘the simultaneous movement of both eyes in opposite directions to obtain or maintain single binocular vision’, also sprach the infinitely wise Wikipedia) is a summation of virtually every band and genre Alessi has dipped her tiny toes in prior to its formation in 2017. Samantha is a girl close to our black heart. Bodacious, vivacious, multi-talented (she plays guitar and bass guitar next to her singing) and with an excellent taste in music to boot. To be entirely frank we were sold on Ferum without even having heard a single note of music. Samantha has put her money where her mouth is. Acta non verba. “Vergence” thankfully lives up to every one of our assumptions in terms of how we imagined Ferum would sound. 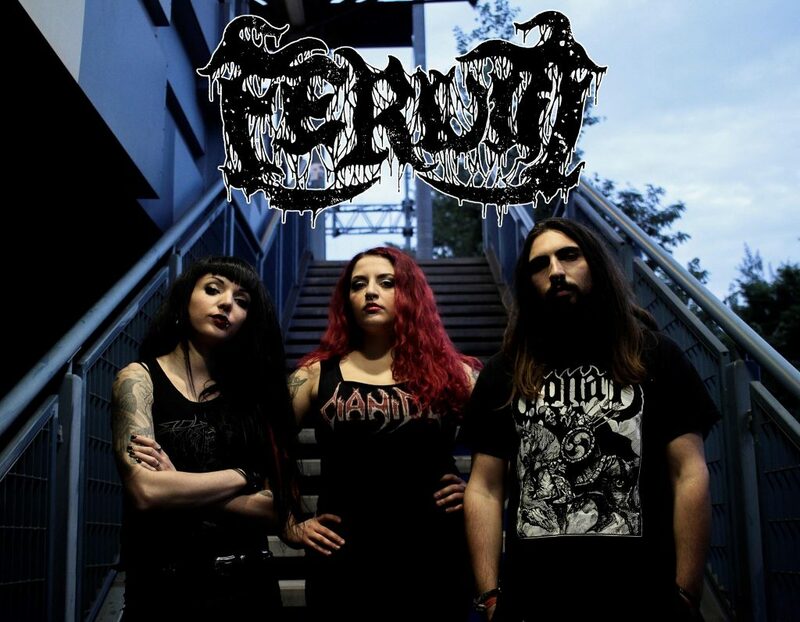 For an Italian band Ferum sounds distinctively Swedish. At least as far as its riffs are concerned. “Vergence” is permeated with the influence of Unleashed (“Where No Life Dwells”, “Shadows in the Deep”) and Necrophobic (“The Nocturnal Silence”), its charnel doom passages recall the darkest moments of early Asphyx (“Embrace the Death”, “The Rack”) as well as Autopsy’s “Mental Funeral” whereas the general direction is somewhere along the lines of Death’s primitive beginnings with “Scream Bloody Gore” and “Leprosy” with a thoroughly morbid and decrepit disposition not unlike Blasphereion. Samantha’s sickly rasps and bellowed grunts sound absolutely monstrous without ever becoming overly guttural or exceedingly serpentine. Matteo Anzelini’s bass guitar is positively thundering with a full-bodied tone that would make Demilich and Gorefest proud. Angelica Pinetti’s drumming is fitting for the style holding the middleground somewhere between Kyle Severn from Incantation, Ilaria Casiraghi from Ekpyrosis, and King Fowley from Deceased (circa “Luck Of the Corpse”). In other words, these two girls and guy know their underground classics, and it shows. 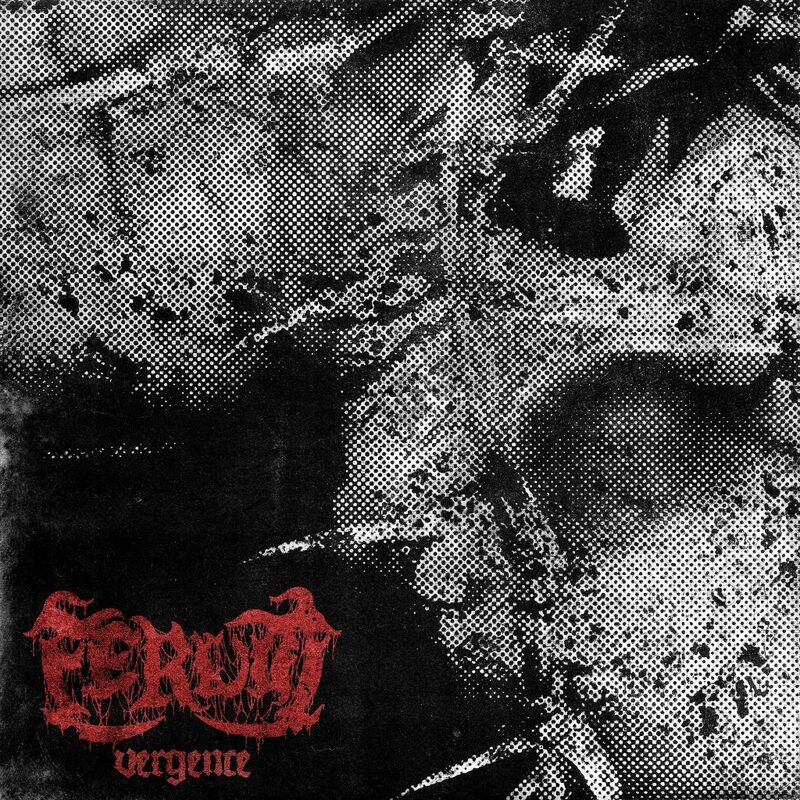 Ferum plays it far closer to the chest than, say, Amthrya – but like them “Vergence” is bereft of any modern influences, which is one of the EP’s biggest selling points. The only thing we sort of miss is a nicely laid out explosive guitar solo or two, but that's mere nitpicking, not a complaint. ‘Siege Of Carnality’ is equal parts “Seven Churches” Possessed, Death circa “Scream Bloody Gore” and any early European death/doom metal pioneer of note with a churning Swedish death metal main riff. ‘Perpetual Distrust’ has guest vocals from Marko Neuman from Finnish funeral death/doom metal combo Convocation (their debut “Scars Across” had some of the greatest artwork in the underground this year). It is by far the most Incantation sounding track of the EP, which is never a bad thing. During its more psychedelic moments it is reminiscent of now defunct Riti Occulti (circa 2012) without said band’s overt retro occult metal imagery and production aesthetic. ‘Subconscious Annihilation’ further explores the doom metal direction of the preceding track and hints that Ferum could very well head into a diSEMBOWELMENT “Transcendence into the Peripheral” direction if they so desired. Not even the closing (and somewhat swinging) psychedelic stoner riff feels out of place eventhough it stands in stark contrast to the rest of the track. ‘Funeral’ is played true to form and Ferum is at its best when playing slow grinding deep cutting Cianide riffs. The brooding outro ‘Ed è Subito Sera’ (‘And then it is Night’) is a black as pitch dirgey doom waltz in tradition of Winter, Sempiternal Deathreign, and (who else?) Cianide set to a poem of Sicilian novelist, Hermetic poet and Nobel laureate Salvatore Quasimodo with a prominent place for Anzelini’s bass guitar. There’s a minor undercurrent of psychedelic – and stoner doom metal to some of the riffing and overall atmosphere with Ferum. Not exactly surprising considering some of Alessi’s and Pinetti’s prior bands but it tends to contrast heavily with their fully realized traditional death/doom metal direction. If one was to compare Ferum to any of the classic bands it would be earliest Hypocrisy, especially “Penetralia” and “Obsculum Obscenum”. Like that band Ferum has the meanest crunch and Samantha’s beastly bellows are as everlasting spewed and vociferously vomited as any of the classic European death metal bands. The similarity in delivery to Acrostichon circa “Engraved In Black” is fairly obvious. Over the last fifteen or so years Italy has become the new Poland in terms of housing some of the fastest, most mechanical and inhumanly technical death metal that is about as glossy as it is soulless. Thankfully that movement is now countered by a resurgence of so-called “cavernous” death metal acts out of the underground. Ferum clearly knows their American and European genre classics. There used to be a time when death metal like this didn’t came with the redundant old school or cavernous prefix and things were easier and simpler back then. Ferum has no intention of reinventing the wheel and they don’t do so either. There’s a dire need for bands as Ekpyrosis, Ferum and Amthrya that defy convention where/whenever they can. Modern death metal tends to retroactively date itself through the usage of all of the usual cover artists and production techniques. Ferum lives and breathes death metal the way it was intended. Samantha never disappoints, and neither does she here. The Latin proverb corvus oculum corvi non eruit never rang truer.